It’s June! 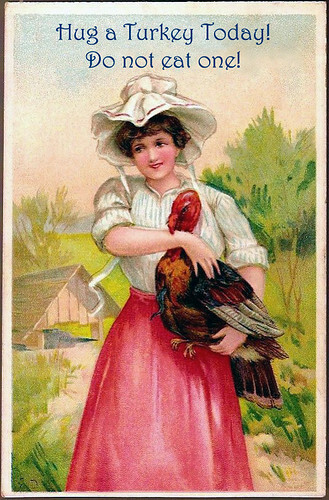 Time to luv-a-turkey, hug-a-kitty, eat-yer-veggies…and panic! June is upon us, and with it comes special day designations that prompt both cheering and jeering from the animal advocacy crowd. Ready? Let’s get start with the big, month-long picture. June is Turkey Lovers Month! But sadly–and predictably–that “love” is gastronomic in nature, so we suggest lovin’ ’em in a kinder, gentler manner. You’ve heard the myth that they’re so dumb they’ll drown looking up at the sky in a rainstorm? Huh-uh. “Smart animals with personality and character” is how one scientist describes turkeys. Downer alert: Watch Mercy for Animals’ undercover video filmed at a Butterball facility…no turkey lovers here. …their claims—extensively disseminated on zoo and aquarium Web sites—greatly outstrip their methodologically limited findings. We therefore urge zoos and aquariums to cease citing this study in their promotional materials as evidence that visitors’ attitudes are changed for the better, as this conclusion is unwarranted and potentially misleading to consumers (source). But guess what? June is also National Dairy Alternative Month! If you haven’t yet made the switch to cruelty-free, plant-based milk, what better time? C’mon, you know you want to! Plan to experiment; yours truly, for instance, started out using soy milk and switched to almond. Fruit smoothies never tasted so udderlessly delicious! Many states offer a free fishing weekend in June to coincide with National Fishing & Boating Week (June 1-9). That’s followed by National Go Fishing Day on June 18th, when sporting anglers trick sentient fish into embedding hooks in their mouths and then, in a display of skill and prowess, “play” the terrified, suffering creatures as they struggle for their lives. In some sort of warped twist, June 18th is also International Sushi Day. If something smells fishy, that’s probably not vegan sushi on your plate! June 4th is Hug Your Cat Day, though some “authorities” claim it’s May 30th. No matter, hugging kitties is a daily treat for many of us. No feline to hug? Why not stop by your local shelter and hug a few? They’d love the attention, and as soon as one wraps his or her paws around your neck and purrs in your ear, you might suddenly recall that it’s also Adopt a Shelter Cat Month! Serendipity is a beautiful thing. June 15th is World Juggling Day. I mention this only in case you’d like to consider a gig juggling vegetables (see it happening here) as a lead-in to the next two days: June 16th and 17th are Fresh Veggies Day and Eat Your Vegetables Day, respectively. There’s really nothing left to say…unless it’s vegan pizza. June 21st is Take Your Dog to Work Day. For those of us who work at home, this is a day like any other. For the rest of you, don’t forget the Mutt Mitts! In a surprise move, the proclamation failed to consult with Worldwatch Institute, where we learn that it takes just one year for 10 tons of catfish waste to drop into a pond producing 5000 kilograms (about 11,000 pounds) of fish. And let’s not forget that it was southern-state fish farmers who first introduced Asian carp to their industry, and those voracious invasives are now lined up to enter the Great Lakes (animated map). So, in the spirit of all things June, we say hug your catfish–don’t eat one. Asian carp in the Great Lakes? (Having grown up on one of the Great ones, this is the stuff of nightmares.) Dangerously-mutating pathogens in factory farms? And I’ve been in a state of near-panic since viewing the PBS Newshour’s segment on China’s insatiable appetite for pork, and the country’s bid to purchase mega-giant factory farm Smithfield Foods (undercover video). Thank dog June 18th is on the horizon–International Panic Day. Could be that the nightmare for pigs is just beginning. But let’s end on a positive note. June 1st is Dare Day, a day to challenge someone else–or ourselves–to do something outrageous. To be the one who stands up, who speaks up–even if we have to do it alone–to make a difference. Give yourself the gift of watching “The Power of One.” It’s under two minutes long, but packs enough inspiration to last a lifetime. Happy June! Love that “fishing hurts” sticker. Hats off the Emory U. researchers. Fun to find out so many factoids, including the existence of Mutt Mitts! My ignorance of the pounds-to-tons conversion forced me to look it up: http://www.blurtit.com/q591744.html. I learned that for every miserable catfish bred in a factory, our land and water receive a double dose of waste. That 2:1 ratio of elimination-to-eats (if you cold-heartedly consider our friends your food) sure smells foul. Happy June to Kind-and-Karing-and-Kool Kathleen! Lots of effort put into this post…and it shows! Thank you! With the exception of the good-news events on the calendar for the month of June… I’d just as soon skip it altogether. “National Fishing and Boating” month??? Really? The catfish in the video is a seriously cool-looking fish (ditto the feeling about tank confinement). I never had much of an appreciation for fish until I started learning about wild salmon some years ago. Now I find fish to be beautiful and fascinating, not to mention sentient. Thanks to you three for your comments and your work for speciesism awareness and the struggle for justice for animals…you guys rock! I most certainly will at once get ones rss feed while i cannot in discovering your own e-mail registration website link or perhaps e-newsletter program. Have virtually any? You need to make it possible for my family realize to make sure that I could join. Many thanks.